BORG. On January 20, at Mater Dei Hospital, PHILIP (former teacher at Liceo Vassalli, Tal-Ħandaq and the Archbishop’s Minor Seminary, and ex-Director of the Department of Libraries and Archives), of Marsa, residing in Mosta, aged 70, passed away peacefully comforted by the rites of Holy Church. He leaves to mourn his great loss, his wife Maria, née Sammut, his children Architect Daniel and his fiancée Vanessa, Notary Dr David Joseph and his wife Luisa, Dr Marika and her fiancé Matteos, his sisters, his brothers-in law, other relatives and friends. The funeral leaves Mater Dei Hospital on Saturday, January 26, at 7.45am, for the Basilica of the Assumption of Our Lady, Mosta, where Mass præsente cadavere will be celebrated at 8.30am, followed by interment at Santa Maria Addolorata Cemetery. No flowers by request but donations to Id-Dar tal-Providenza, Siġġiewi, will be greatly appreciated. Lord, grant him eternal rest. CALLEJA. On January 22, at Mater Dei Hospital, FRANCESCA of Sliema, aged 79, passed away peacefully comforted by the rites of Holy Church. She leaves to mourn her great loss her daughter Louise and husband Alex, her daughter Christine and husband Keith, her daughter Alexandra, her son Malcolm and partner Roberta, grandchildren, other relatives and friends. The funeral cortège leaves Mater Dei Hospital on Friday, January 25, at 7.45am, for the Carmelite parish church, Balluta, St Julians, where Mass præsente cadavere will be said at 8.30am, followed by interment at Santa Maria Addolorata Cemetery. Donations to Hospice Malta, Balzan, will be greatly appreciated. Lord, grant her eternal rest. CAMILLERI. On January 23, at Mater Dei Hospital, GAETANO, aged 60. He leaves to mourn his loss his wife Lorraine, née Thompson, his daughters Elaine and her husband Domenico Mirabile and Daniela and her husband Dr Matthew Xerri, his grandchildren Diego and Giulia, his brothers and sisters, other relatives and friends. Mass præsente cadavere will be said tomorrow at 10am at Our Lady of Sorrows church, Ħamrun, followed by interment in the family grave at Qrendi cemetery. The family regret they are unable to receive visitors. Lord, grant him eternal rest. CARUANA. On Monday, January 21, at his residence, ALBERT, aged 72, went to meet the Risen Lord, comforted by the rites of Holy Church. He leaves to mourn his loss his wife Fiona, née Lapira, his children Kurt Caruana and Roberta Caruana Stivala, Dieter Caruana and Charlene Briffa, Kerstin Caruana and Stuart Leader, his grandchildren, nephews and nieces, other relatives and friends. The funeral cortege leaves Mater Dei Hospital tomorrow, Friday, January 25, at 8am for Jesus of Nazareth parish church, Sliema, where Mass præsente cadavere will be said at 8.30am, followed by interment at Santa Maria Addolorata Cemetery. Lord, grant him eternal rest. CARUANA. On January 21, HENRY, aged 81, went to meet the Risen Lord and to join his son Sandro and others he loved. He will be deeply missed by his wife Laura, née Bisazza, his son Claude and his wife Nisha, his son Leon and his wife Clara, his adorable grandchildren Amy, Julia and Samuel, his dedicated carer Leth and many relatives and friends. 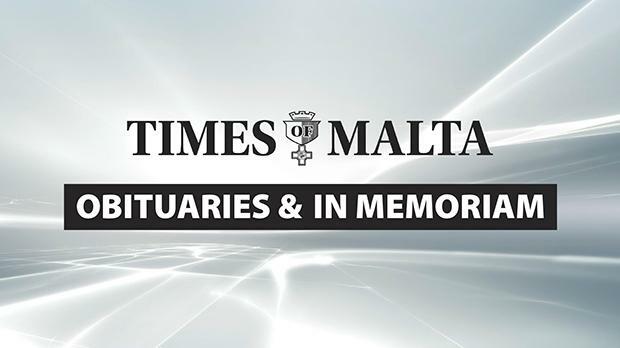 The funeral leaves Mater Dei Hospital tomorrow, Thursday, January 24, at 9am, for Mary Immaculate Mother of the Church parish church, Tal-Ibraġ, where Mass will be celebrated at 9.30am, followed by interment at Santa Maria Addolorata Cemetery. No flowers by request but donations to id-Dar tal-Providenza, Siġġiewi, will be greatly appreciated. Lord, grant him eternal rest. CARUANA DEMAJO. On January 23, at Mater Dei Hospital, MARIA, aged 99, passed away peacefully comforted by the rites of Holy Church. She leaves to mourn her loss her son Giannino and his wife Evelyn, her niece Antoinette and her husband Thomas Abela, other relatives and friends. The funeral cortège leaves Mater Dei Hospital on Friday, January 25, at 8.30am, for St Cajetan parish church, Ħamrun, where Mass præsente cadavere will be said at 9am, followed by interment at Santa Maria Addolorata Cemetery. Lord, grant her eternal rest. GIALANZÉ. On January 22, at Mater Dei Hospital, WILFRED of Sliema, passed away peacefully at the age of 72, comforted by the rites of Holy Church. He leaves to mourn his great loss his sister Miriam, his brother Godfrey, his in-laws, nephews and nieces, other relatives and friends. Funeral arrangements will be announced later. GRECH. On January 22, at Sir Antony Mamo Oncology Centre, MARY, aged 86, passed away peacefully comforted by the rites of Holy Church. She leaves to mourn her loss her sons Louis and his partner Jean, Frederick and his wife Nadine, Stephen and his wife Miriam, Ray and his wife Emily, and her daughter Irene and her husband George, her grandchildren, nephews and nieces, relatives and friends. The funeral leaves Mater Dei Hospital tomorrow, Thursday, January 24, at 1.30pm, for Stella Maris parish church, Sliema, where Mass præsente cadavere will be said at 2pm, followed by interment at Santa Maria Addolorata Cemetery. No flowers by request but donations to Id-Dar tal-Providenza, Siġġiewi, will be appreciated. Lord, grant her eternal rest. MICALLEF. On Saturday, Jan­uary 19, FRANCIS SAVIOUR, direc­tor of Tutto Marketing Ltd and president of the Għaqda Festi Esterni Ssma. Trinità, Marsa, aged 56, passed away suddenly in Milan, Italy, while on a business trip with his wife. Loved and remembered by his wife Carmen, his daughters Annabella and Amber and her husband Salvatore, his brothers and sisters and their respective spouses, his in-laws and their families, nephews, nieces, relatives, employees, friends and also the committee and members of the Għaqda Festi Esterni Ssma. Trinità. Funeral details will be announced later. Lord, grant him eternal rest. MUSCAT. Sud­denly, on January 20, perit TONY MUSCAT, at the age of 72, comfor­ted by the rites of Holy Church. He leaves to mourn his terrible loss his dearly beloved wife Elspeth, née Borg, his much loved sons Duncan and Claudia, and Keith, his sisters Margot Briffa and Ina Debono, his brother-in-law Tony Cassar, his nephews and nieces Noel and Nigel Cassar, Nikolai, Kristjan and Karl Briffa, Miguel and Anatole Debono, and their respective families; his sisters-in-law Nancy Gulia, Marcelle Busuttil, Marlen Micallef, Maris Zammit and his brother-in-law Robert M. Borg, and their families; his nieces and nephews-in-law Myra Tilney, Gaby Torpiano, Cindy Chapelle, Bill and Ronnie Busuttil, Paul Micallef Jr, Marcelle Moore, Sandra Sullivan and Michael Zammit, and their respective families, relatives and so many friends. The funeral cortège leaves Mater Dei Hospital on Saturday, January 26, at 9am, for Mary Immaculate Mother of the Church parish, Tal-Ibraġ, where Mass præsente cadavere will be celebrated at 9.30am, followed by interment at Santa Maria Addolorata Cemetery. Flowers are welcome, as well as donations to Tony’s favourite charity, id-Dar tal-Providenza, Siġġiewi. Tony touched so many hearts. Lord, grant him eternal rest, which he so richly deserves. SCIBERRAS. On Monday, January 21, at Mater Dei Hospital, ANTHONY (Ninu ta’ Ġilormu), of Birkirkara, aged 84, comforted by the rites of Holy Church. He leaves to mourn his loss his wife Manuela, his nine children Carmen, widow of Ninu, John and his wife Josette, Albert and his wife Marisa, Raymond and his wife Lucienne, Michael and his wife Catherine, Noel and his wife Nathalie, Jeffrey and his wife Rose, Joseph and his wife Donatella, and Tania and her husband Emanuel, his grandchildren, his sister-in-law Lora, widow of Karmnu, nephews, nieces, other relatives and friends. The funeral leaves Mater Dei Hospital tomorrow, Thursday, January 24, at 8am, for St Helen’s Basilica, Birkirkara, where Mass præsente cadavere will be said at 8.30am, followed by interment in the family grave at Santa Maria Addolorata Cemetery. No flowers by request but donations to id-Dar tal-Providenza, Siġġiewi, and Hospice Malta, Balzan, will be greatly appreciated. Lord, grant him eternal rest. WARRINGTON. On January 19, Dr FRANCA WARRINGTON, née Zammit Hammet, widow of Alexander, aged 83, passed away peacefully at Casa Antonia, Balzan, comforted by the rites of Holy Church. She leaves to mourn her loss her daughters, Shirley and her husband John Mansfield, Sr Francis Hilary OSC (Poor Clare), Isabelle, and Monica and her husband Mohamed Mokhtari, her grandchildren Sarah, Catherine, Lizzy, Daniel, Fiona, Hannah, Clara, other relatives and friends. The funeral leaves Casa Antonia on Saturday, January 26, at 8am, for Balzan parish church, where Mass præsente cadavere will be said at 8.30am, followed by interment at Santa Maria Addolorata Cemetery. No flowers by request but donations to St Clare’s Monastery, St Julians, will be greatly appreciated. Lord, grant her eternal rest. ATTARD MONTALTO. In loving memory of ALEX on the 17th anniversary of his death. Deeply missed by all his family. BORG GRECH. In loving memory of JOSEPH BORG GRECH, Ph.C. on the 39th anniversary of his death. Never forgotten by his children Lucia, Ninette, Joseph and Marcelle, Renzo and Evelyn and grandchildren. May he rest in peace. CACHIA – ANTHONY (Nani). Treasured memories of a very dear father and grandfather on the 35th anniversary of his death. Always in our thoughts and prayers. Lilian and Leslie, Kevin and Audrey, and Carol. CAMILLERI. In loving memory of LOUIS, today the 18th anniversary of his passing away. Sadly missed and always remembered by his children Ray and Stephanie, Denise and Bill, Brian and Maria, Tim and Corinne, and his grandchildren Alison, Lara, Claire, Victoria, Miguel, John, Becky and Benji. DELICATA. In loving memory of our dear mother URSOLA on the anniversary of her demise. Fondly remembered by her daughter, sons, in-laws and grandchildren. Lord, grant her eternal rest. FARRUGIA – Dr PAUL FARRUGIA. In loving memory of a dear husband, father and grandfather on the 27th anniversary of his passing away. Forever in our thoughts and prayers. His wife Maria, his children Karen, Gianrico and Mark, in-laws and grandchildren. Rest in peace. GALEA. Loving and unfading memories of our parents PAUL on his 46th anniversary, and our mother IMELDA on her first anniversary on February 3, on their passing to eternal life. Forever in our thoughts and prayers. Catherine, Joseph, Marthese, Mark and family. PULIS. In loving memory of ROSA, a beloved mother and grandmother, today the eighth anniversary of her meeting with the Lord. To live on in the hearts of those we love is not to die. Dear Lord, grant her eternal rest. Yvonne, Josette, Alex and families. TOLEDO. Treasured memories of a dear mother and grandmother, MARYROSE, on the first anniversary of her demise. Forever in our hearts and fondly remembered by her husband Frank and her daughter Marlene and Joe, as well as by her sons Roger and AnnRose, Fr Ray, Noel and Miriam and their families. Lord, grant her eternal rest. TORTELL. In ever loving memory of GINA, née Schembri, today the 42nd anniversary of her death. Fondly remembered by all her children, relatives and friends.